The Christmas tree is a tradition associated with the celebration of Christmas. It is normally an evergreen coniferous tree that is cut in the wild and brought into the home. It is decorated with Christmas lights and colourful ornaments during the days around Christmas. An angel or a star is often placed at the top of the tree. Fir trees outside the home may be decorated in a similar fashion. 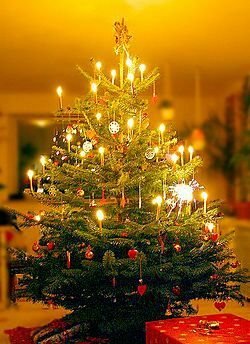 The custom of the Christmas tree has its origin among the Protestant peoples of Northern Europe. It is not however a religious symbol. 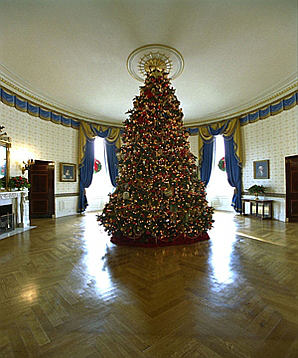 Both natural and artificial trees are used as Christmas trees. Some trees are sold live with roots and soil, often from a nursery, to be planted later outdoors and enjoyed (and often decorated) for years or decades. Artificial trees have become increasingly popular, as they are considered more convenient and (if used for several years) less expensive than real trees. 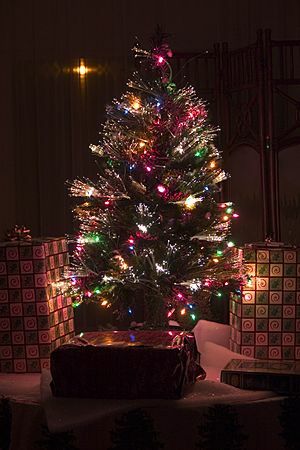 Trees come in a number of colors and "species", and some come pre-decorated with lights. At the end of the Christmas season artificial trees can be disassembled and stored compactly. The first artificial trees that were not green were the metallic trees, introduced about 1958, and quite popular through the 1960s. Other artificial trees may look nothing like a conifer except for the triangular or conical shape. These may be made from cardboard, glass, plastic, or from stacked items such as ornaments. Such items are often used as tabletop decorations. Chichilaki, a Georgian Christmas tree variety. 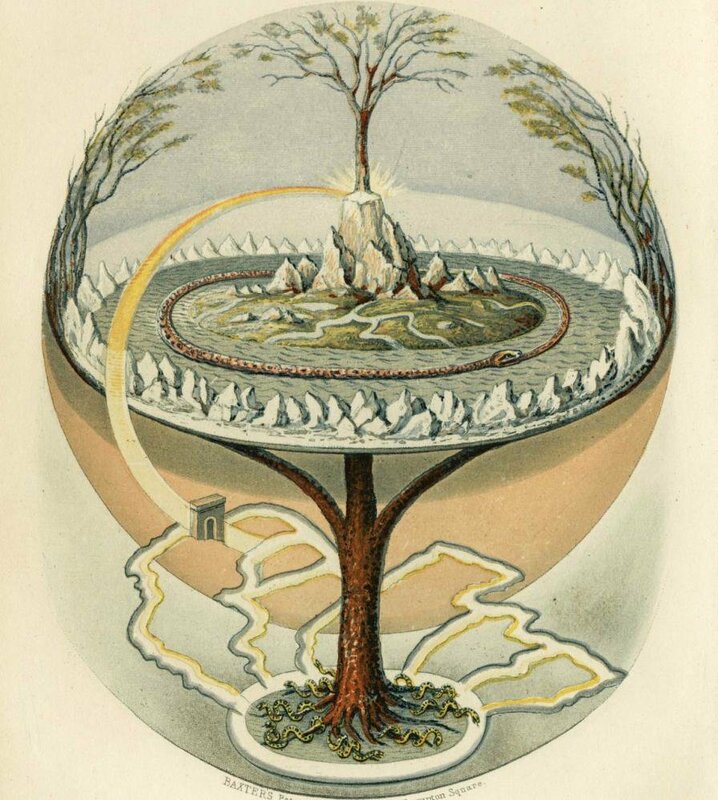 First published image of a Christmas tree, frontispiece to Hermann Bokum's 1836 The Stranger's Gift. 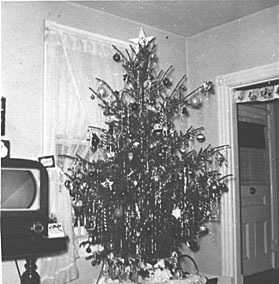 A Christmas tree from 1951, in a home in New York state. An early example of a public Christmas celebration tree for the unemployed in Prague. Illustration for Harper's Bazaar, published 1 January 1870. Christmas Tree in the cozy room at the Wisconsin Governor's mansion. Christmas tree in Salerno old town, Italy, 2008.
in Lisbon (2005), at 75 metres (246 feet) the tallest Christmas tree in Europe. A vintage aluminum tree, lit by a rotating color wheel. Christmas tree Facts for Kids. Kiddle Encyclopedia.